Recent finds of large hydrocarbon reserves off the Namibian coast are leading to increased exploration (seismic surveys) and soon extraction of these resources. The increased ship traffic and noise in the environment is likely to have a negative effect on whales and dolphins using the same area. We know that humpback whales migrate past the Namibian coast on their way between Antarctic feeding grounds and equatorial breeding grounds. However, there is less certainty about the timing of this migration or where the main migration stream occurs in terms of distance offshore – much has changed since whaling ships collected the last dedicated sightings. We need to know these facts to be able to mitigate the impacts of human noises on these animals. To date, we have opportunistically collected biopsies and photo-ID data from free swimming and stranded humpback whales. Our photo-ID catalogue has been significantly increased by the contributions of Mike Lloyd and Orlanda Sardinha working on the Catamaran Charters boats www.namibiancharters.com. 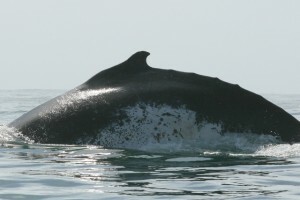 The tail catalogue (humpback whales are usually identified from the patterns on the underside of their tails) has already been compared to the west South African catalogue, with no matches found so far. We are currently building on our initial efforts investigating humpback whales in Namibia coastal waters and during 2012 will spend more time investigating humpback whales specifically. We hope to assess the seasonal patterns in the occurrence of humpback whales using shore-based tracking from Pelican Point at Walvis Bay and Diaz Point at Lüderitz and increase collection of photographic and genetic samples.